The screen is part of NHK's research into future TV form factors. 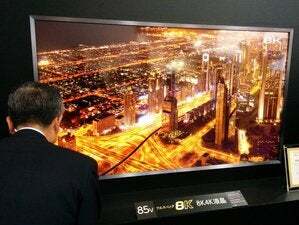 Japanese public broadcaster NHK has developed a prototype 8K screen that’s large, thin and shows an amazing picture. 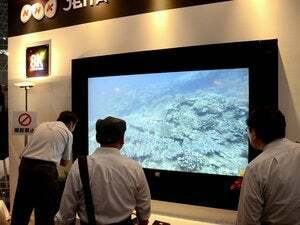 The screen is made up of four 65-inch 4K OLED panels joined together to make a monster 130-inch display. They panels were produced by LG Display and are just 1 millimeter thick. They’ve been placed on a backboard to give the entire display a bit more strength and that has doubled the thickness to just 2mm. 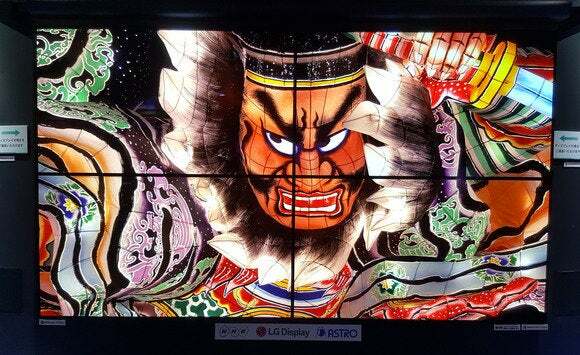 NHK worked with Japan’s Astro Design to turn the LG panels into a working television. It’s being fed with uncompressed 8K video resulting in an amazing image and turning heads at this week’s Ceatec electronics show near Tokyo. Alas, the screen isn’t available and might never be. It’s part of the organization’s research into future television form factors, including flexible TVs that can be rolled away when not needed, or pasted up like wallpaper. 8K refers to broadcasts with a resolution of 7,680 x 4,320 pixels. That’s 16 times the resolution of today’s full high-definition (FHD) broadcasts and four times that of the 4K standard, which is only just emerging in many other countries. 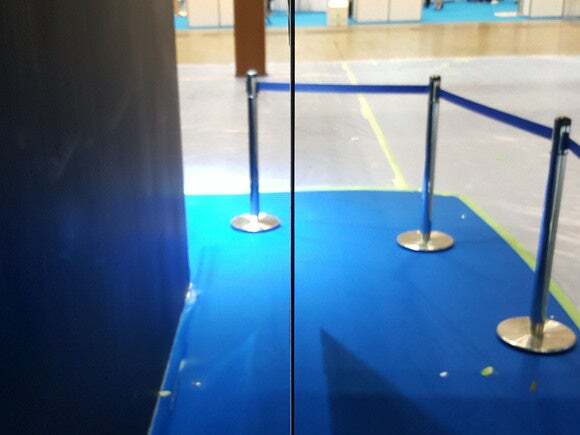 A side view of NHK’s prototype 8K OLED display that’s just 2 millimeters thick, seen at the Ceatec electronics show near Tokyo on October 3, 2016. NHK has been developing 8K broadcasting technology for more than a decade and first demonstrated the technology in 2002. Earlier this year, it began daily trial broadcasts via satellite that included select competitions from the Rio Olympics. Broadcasting in 8K isn’t without its difficulties. The signals require a significant amount of data and it has to be processed in real time. Still, as technology progress it gets easier every year. Via satellite, a compressed 8K video stream requires 85Mbps. Regular 8K broadcasting is due to being in 2018 with a full service on air in time for the Tokyo Olympics in 2020.